This trip started with an early morning drive to the Mohawk Lakes trailhead. We drove up as far as we could on the dirt road until we hit the end of the road by the aquifer. We started on the trail around 7:30 am and soon enough passed by the old ski lift that now looks more like a pile of junk. Some morning low clouds blocked the direct sun and made for some nice early morning scenery and photos. This however worried us a little as it was warm and any clouds this early may lead to earlier than normal thunderstorms. 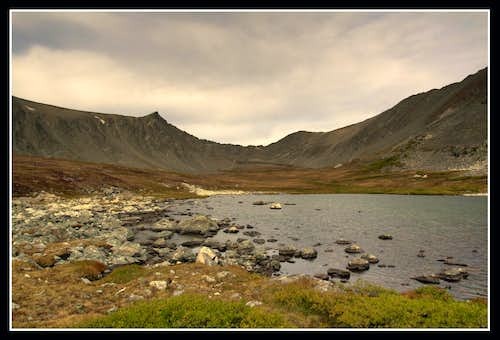 The first lake we passed by was lower Mohawk Lake and the scenery in the area was great especially for the Tenmile range which sometimes looks a little "over mined"
We did pass by some holes in the ground that were indicative of miners but they were well hidden. There were however a large amount of social trails that took away from the remote feeling that I seek in the mountains but nonetheless I still enjoyed it. We climbed up and above the large waterfall and passed by the second lake where the suns rays lit up the clouds above the east ridge very nicely. By now we got our first very nice views of Pacific Peak that seems like a large dagger rising out from the ground high above the valley. The plan was to ascend the snow route (yes there wasn't going to be any snow) on the northeast slopes and pass by Pacific Tarn before climbing Pacific and Atlantic Peaks. Looking up at the ominous ascent we started up. We were happy to make pretty good time as we made our way up the extremely loose rock slope and started many small rock-slides. 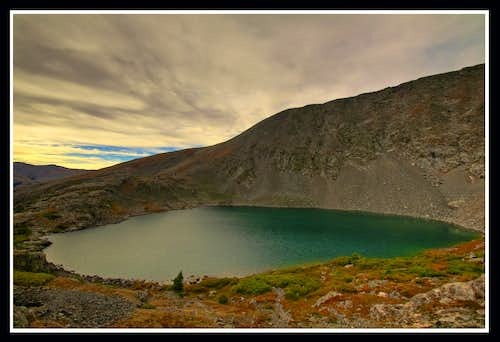 Upon reaching the 13,000 foot plateau where Pacific Tarn; the highest named lake in North America sits, we looked down at the Mohawk Lakes and were overwhelmed with the views. 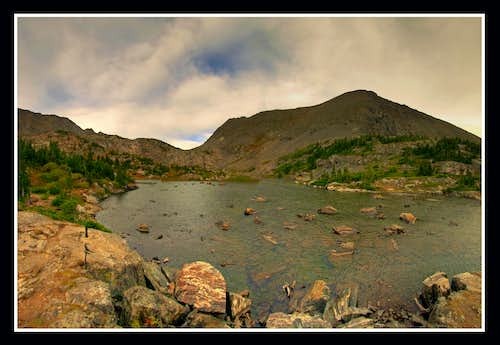 We took a nice break at Pacific Tarn and headed for Atlantic Peak. This ridge run went by quickly although very windy. We didn't stay at Atlantic's summit very long but we were able to see the hoards of people atop Quandary. I sure was happy to be on Atlantic where I knew we were the only ones to climb it that day. Not another soul seen. I regret not taking any photos at Atlantic Peak but it was very windy and I wanted to get down fast. From Atlantic Peak we ran the ridge to Pacific. I really enjoyed the ridge and we summited Pacific with lots of time to relax at the top. The wind nicely stopped and it warmed up a bunch with the sun coming out. There however were no clouds building which gave us some extra time to hang out at the top. I would say that Pacific is one of the better summits in all of the Tenmile/Mosquito range due to its look, quality of the climb and remoteness. We returned the way we came. The descend back down to Pacific Tarn was fun and while I waited I enjoyed the beauty of this wonderful lake. the descent back down the snow slope was a little sketchy as large boulders rolled all the way down passing us in rock-slides as we went down. A little careful attention though and we made it down. Upon reaching the Mohawk Lakes in mid-afternoon the entire valley was flocked with people. The peaceful alpine valley that was deserted and beautiful early in the morning was now full of people. And what do we do on our return trips after a nice climb? We brag to all the casual hikers about where we went. I probably told 10 people that "we climbed that dagger looking peak high above the valley" and they all were jaw dropping amazed. Makes me feel good! Once we returned to the car we met another group of people that were 4-wheeling. After talking to them for awhile we started back for Golden where homework would then take over our lives. Altogether...a great day in the Rocky Mountains and some great photos taken!